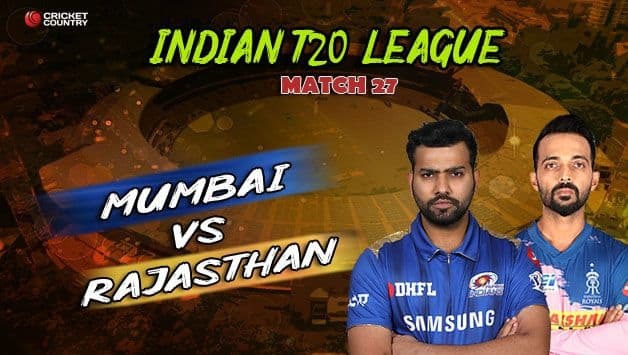 Welcome to our coverage of Game 27 of the Indian Premier League 2019 in which three-time winner Mumbai Indians host Rajasthan Royals. Rajasthan win! Shreyas Gopal smacks a boundary to take Rajasthan Royals home. What calm nerves on this youngster. Mumbai came close with those crucial blows but Rajasthan pull it off. Terrific stuff. The Royals notch up their second win of the season. Over 19: OUT! A faint edge from Steve Smith and Ishan Kishan takes that one. Smith walks, the umpire puts his finger up. What is happening here? Rajasthan Royals, what are you doing? Wickets are falling in a heap. To make matters worse for Mumbai though, there’s a drop catch from Ishan Kishan. Action all around! 7 needed off 7. Over 18: TWO WICKETS in that over! 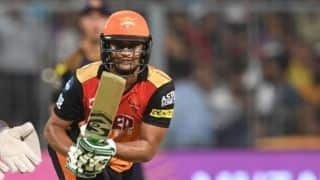 Rahul Tripathi slog sweeps Krunal Pandya to his brother Hardik at deep midwicket and off the final ball, Krunal cleans up Liam Livingstone with a full and straight ball. This is not helping Rajasthan Royals. Mumbai trying to pull off a memorable heist here. Steve Smith will need to knock off the remaining runs. 14 required off 12. Over 17: OUT! 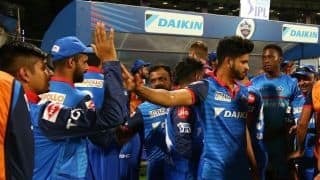 Ooohhhhh, Mumbai Indians gets another as Bumrah sends back Sanju Samson out LBW after an unsuccessful review taken by the batsman. Rajasthan 171 for 3 and need 17 off 18 balls. Is there a twist somewhere? Over 16: Two overs without a boundary before this. Rajasthan level it by getting two off Krunal Pandya’s third. Sanju Samson and Steve Smith help themselves to a FOUR each as the score moves to 168 for 2. Just 2o more required off four overs with eight wickets in hand. Over 15: Right then! Hardik Pandya gives away just five off his first over. Rohit Sharma is clearly running out of options. That’s two overs without a boundary for Rajasthan to reach 158 for 2. Over 14: And it comes to an end. A fine innings from Buttler – perhaps one of the best this season – has ended. A slog sweep brings a close to his knock. A top edge off Rahul and OUT. He goes for 89. Rajasthan Royals 153 for 2. Over 13: GLORIOUS! Absolutely GLORIOUS from Buttler. FOUR boundaries and TWO sixes in that over from Alzarri Joseph, meaning every ball has been smacked for a boundary in that over. Spare a thought for the poor kid. After that dream debut against Sunrisers Hyderabad, he is all over the park. SIX, FOUR, FOUR, FOUR, FOUR and SIX – that’s how that over read from Joseph. He has raced to 89 off 42 balls. Absolute carnage and there is pin-drop silence at the Wankhede. Rajasthan 146 for 1 and need just 42 more off 42. Over 12: Jos Buttler is simply unstoppable. He welcomes Rahul Chahar back into the attack with a colossal SIX towards cow corner. Even Sanju Samson is beginning to switch gears. Takes the ball on the full and deposits it over long off. 15 off that over as Royals are cruising. They reach 118 for 1. Over 11: A quiet over for the Royals; it’s been a rarity in this innings. Jasprit Bumrah keeps it tight in his second over. Rajasthan 103 for 1. Over 10: FIFTY for Buttler off 29 balls. He surely is the heart and soul of this Rajasthan Royals side. And with that the 100 also comes up for the Royals for the loss of 1 wicket. Over 9: Whoa! Buttler really putting on quite a show here. Two sixes off that over from Krunal Pandya and Rajasthan are cruising at the moment. These are effortless sixes. The first one was bludgeoned over long-on and the next one landed almost in the similar area. Brute force. Rajasthan Royals 89 for 1. Over 8: BOOM! Buttler goes downtown. A flighted delivery from Rahul Chahar and Buttler got underneath it and lofted into the sidescreen. They don’t come any cleaner than that. Rajasthan 73 for 1. Over 7: WICKET! Krunal Pandya strikes in his first over with the wicket of Rajasthan Royals captain Ajinkya Rahane. He was batting so well before playing that slog sleep which landed straight into the hands of Suryakumar Yadav. And once again, right after the break a wicket falls. Rajasthan 64 for 1. Over 6: End of the Powerplay and Rajasthan are getting better with every passing over. Bowling change from Mumbai Indians and the new bowler Jasprit Bumrah goes for two boundaries. A sublime cover drive for FOUR off the first ball brought up the FIFTY for Rajasthan. Ajinkya Rahane is batting like a million bucks out there. Over 5: Ajinkya Rahane is setting up this chase really well. The skipper takes three boundaries off that over from Joseph – a cover drive, a six over midwicket and a ramp shot. That’s more like it. Fine start for Rajasthan, who reach 49 without loss. Over 4: Close! But Rajasthan Royals and Jos Buttler survive. Rahul Chahar foxed Buttler, who went for the reverse sweep. A huge appeal followed and the umpire turned it down. Mumbai went upstairs but the ball was hitting the off stump. And since it was umpire’s call, Buttler stays. Rajasthan 32 without loss. Over 3: Jos Buttler opens up and carts a SIX down the ground off Behrendorff. Slightly full and Buttler goes with the swing, almost like an aerial off drive. Rahane gets a couple of boundaries himself. A good over for Rajasthan Royals who get 16 off it to reach 28 without loss. Over 2: Rajasthan are away! Two boundaries off Alzarri Joseph’s first over from Jos Buttler on the off side gets Rajasthan Royals to 12 without loss. Over 1: Almost a wicket! Woah, Mumbai Indians could have had Rajasthan skipper in the first over but Rohit Sharma, fielding at mid-off, just couldn’t judge that chance properly. Went behind but it just beat Rohit’s hands. Two balls later, Behrendorff had Rahane again, this time out LBW but a good review taken by the skipper showed the ball going over the stumps. What an eventful over. Rajasthan 4 for 1. A bit of a lull there in between with Pollard struggling for his 12-ball 6 and Shreyas Gopal adding to the pressure with some tidy bowling but that final swing was the perfect finish from Pandya (28* off 11) whose laid the perfect end to a fine start provided my Quinton de Kock’s knock of 81. End of the Innings: Mumbai Indians finish with a flourish. 16 off that over gives them a total of 187 for 5. Hardik Pandya ends the innings in style with two fours and a six as MI take 16 off that over. Three wides in that over didn’t help Jaydev Unadkat. But it’s a good total none the less. End of Over 19: OUT! A fine innings from de Kock comes to an end. Begins the over with a cracking boundary through the covers but a tired shot next ball led to his downfall. Gave himself room and is out caught at long-off where Jos Buttler takes a wonderful catch covering a good distance and putting in the dive. Pandya caps off the over with a helicopter shot for a SIX. Mumbai 171 for 4. One over remains. End of Over 18: In the slot and deposited over cow corner. Hardik Pandya begins in style. de Kock just struggling to find his timing here. Mumbai 158 for 3. End of Over 17: TOP EDGE and TAKEN! A fine catch from Shreyas Gopal and Rajasthan have taken the big wicket of Kieron Pollard. Slightly short from Jofra Archer and Pollard goes for the big swing only to find the top edge of the bat. Gopal took the catch at midwicket away from his body going behind. Meanwhile, de Kock gets a boundary off a bull toss, a much-needed one. Mumbai Indians 145 for 3. Three overs remain. End of Over 16: de Kock top edges a slog sweep which goes behind Jos Buttler. Unadkat finishes an otherwise decent over. Mumbai 135 for 2, just a little stuck in the last three overs. Can they get to 180? This partnership is 19 off 18 balls and Mumbai have eight wickets in hand. End of Over 15: Gopal finishes an excellent spell of none for 20. Mumbai 126 for 2. Five overs remain. End of Over 14: BOWLED HIM! Suryakumar Yadav gives himself room but is beaten as the ball brushes the off stump. His brief stay comes to an end. He looked good for his 16. Meanwhile, de Kock muscles one on the off-side after surviving a near run-out chance. Mumbai Indians marching along nicely at 124 for 2. End of Over 13: SIX! Suryakumar Yadav goes down the ground to Gopal and gets his first MAXIMUM. Mumbai Indians scoring at an impressive pace to reach 117 for 1. End of Over 12: FIFTY for Quinton de Kock, comes off 34 balls as Mumbai continue to march along nicely. They need de Kock to carry on, especially since Rohit couldn’t convert his start. The big man Kieron Pollard is ready with his pads on. The 100 also comes up for Mumbai, who reach 104 for 1. End of Over 11: GONE! Rajasthan finally break through. Rohit misses his half-century and holes out to Jos Buttler at long-on for 47. Jofra Archer bowls it full and Rohit goes for the heave but doesn’t time it as well as he’d have liked. Mumbai 97 for 1. End of Over 10: Mumbai 92 without loss. Rohit takes Gowtham on, and is rewarded with 16 runs from the over. He dances down the ground and deposits the ball over long on. Two balls later, Gowtham bowls fuller and Rohit drills it over the bowler’s head. He tried to shorten the length but the Mumbai skipper cuts the ball and finds the gap on the offside for a boundary. Both batsmen approaching their half-centuries. End of Over 9: Mumbai 76 without loss after another tidy over from Shreyas Gopal. Just four runs off it. End of Over 8: Good over for the Mumbai Indians to move to 72 without loss. Liam Livingstone gives away 13 off his first over, including two SIXES from Quinton de Kock. An attempted off spinner turned into a full toss and de Kock plundered it over long on. The next one was better, a slog sweep that comfortably cleared the boundary. End of Over 7: There’s some turn! Shreyas Gopal beats de Kock twice outside off stump in his first over. Based on that first over, there’s purchase for the spinners. MI 59 without loss. Rajasthan trying to come back with two tidy overs. End of Over 6: The Powerplay is done and Mumbai would be pretty happy with their score of 57 without loss. A tidy effort from Jaydev Unadkat in his first over. End of Over 5: The FIFTY comes up for Mumbai, and it happened inside five overs. Jofra Archer took the outside edge off de Kock’s bat which went past the keeper and into the boundary. However, there were no half-measures next ball as QDK swivelled across and pulled it over deep-midwicket for a SIX. Mumbai Indians 53 without loss. End of Over 4: WHAM! More runs beginning to come. Drives Dhawal Kulkarni through the covers and caps off the over with back-to-back boundaries – one over the infield on the off side and then a crisp square drive. Rohit looking in ominous form. He hasn’t set the tournament ablaze yet. Could this be the evening? Mumbai 41 for 0. End of Over 3: Right then, Mumbai Indians get a move on as QDK and Rohit open their arms. They take 18 off that over from Gowtham – de Kock helping himself to a SIX and FOUR, and Rohit sweeping towards fine leg. Mumbai Indians 27 without loss. End of Over 1: Krishnappa Gowtham starts the proceedings for Rajasthan and manages to keep Rohit Sharma and Quinton de Kock quiet. Just five runs off that over – three singles and a double – as MI go 5 without loss. Milestone Alert: Mumbai Indians become the first-ever team to play 200 T20I matches. Behind them, Somerset have played 199 games, Hampshire are at 194, Royal Challengers Bangalore have 188 games and Kolkata Knight Riders and Sussex are tied at 187. Ajinkya Rahane: We will bowl first. Not sure how this pitch will play, but it will get better under lights. We have been playing some good cricket, but in T20s, we need to play well in the crunch situations. We have a few changes. Stokesky is injury and replaced by Liam Livingstone, Gowtham is back as well. Rohit Sharma: It’s a 4 PM game, should help the spinners. The pitch shouldn’t be much of a factor. We need to play some good cricket, we are in a roll as a team and need to continue doing it. One change for us, I am back in place of Siddesh, who is unlucky to miss out. He looked good the other day, but this is a long tournament and he should get more chances in the future. Rajasthan Royals opt to bowl against Mumbai Indians after skipper Ajinkya Rahane wins TOSS at the Wankhede Stadium. Hello and welcome to CricketCountry‘s coverage of Game 27 of the Indian Premier League 2019 in which three-time winner Mumbai Indians host Rajasthan Royals. TOSS coming up shortly.